There are only few preparations of beef I tried in my kitchen. Among them the Kerala style beef ularthiyathu (spicy roast) is my favorite. 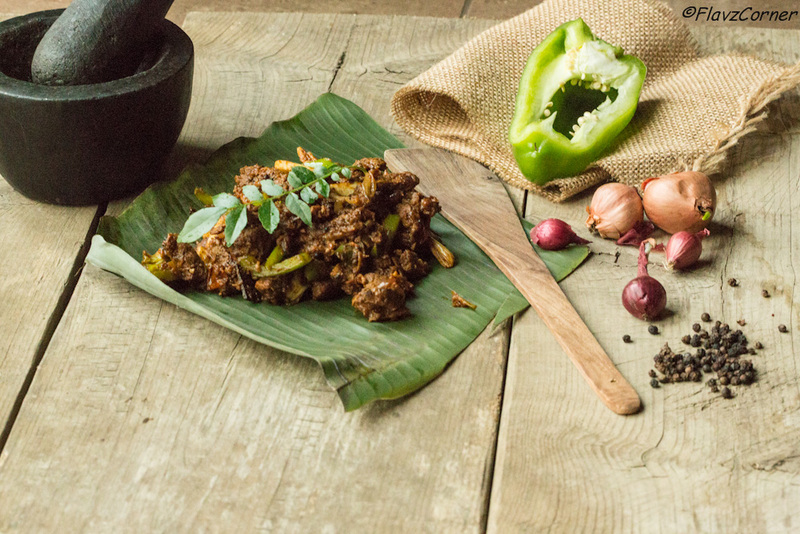 Today’s post is a slight variation to the regular Kerala style beef. 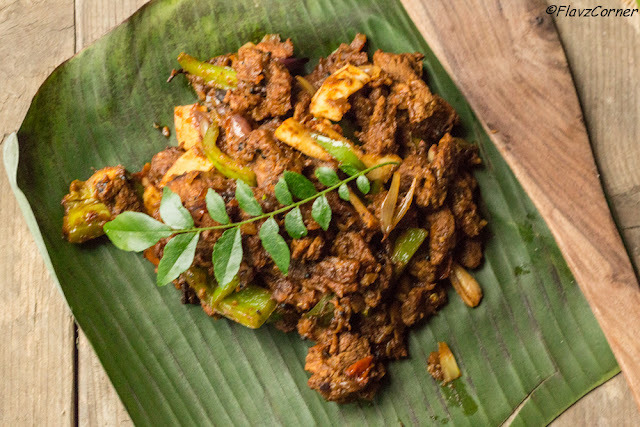 Kerala beef fry is a delicacy served in southern part of India which is close to the heart of Keralites even if they are far away from home. Beef cooked with a handful of spices are then stir fried with freshly crushed pepper. This spicy dish is usually served with plain steamed rice, Roti or Chapathi (Indian flat bread). The wacky presentation of this recipe doesn’t give justice to the beef dish. But I can assure you that it was a yummy beef variation I tried and was a perfect combination with radish Paratha (stuffed Indian flat bread) I served with. I used Top Sirloin cut beef for this preparation, which is supposed to have lower fat content that other parts. The bell pepper imparts a nice flavor to the spicy beef preparation. The piece of banana leaf you see was supposed to be the 'Fresh Banana Leaf’ I got from Indian store. Few months ago I heard from someone that our nearby Indian grocery store carries fresh banana leaves. I was impelled further by my friend Vineetha’s post at Malabar Ruchi to get hold of some fresh leaves. The next day, I paid a visit to the store to grab some leaves. To my dismay, the store owner told me to special order. He gave me the details, it was a bit expensive for single leave, but I told him to order it as I was so determined to get it. He took my phone# to confirm the arrival and pickup. A day later I got a call at work from him confirming the order. I was over excited and shared the news with hubby and kids, not sure if they really cared or not :). Couple of days later I got another call confirming the arrival of the leaves. The next day after work, I picked up my kids and rushed to the Indian store to get the precious leaves. The helper in the store took us to back of the store and opened the cooler room and cut opened a very long box, I was impatiently waiting. He took the first leaf out and I was shocked, it was all ripped and wilted. Seeing my face, he told me to pick what I want. Frantically I started checking the rest of the leaves and picked one which was 60% ripped :(, the best I could get from there. With a smile on the face, the guy told me I am sorry this is what we get. You can imagine my feeling. It was hard for me to determine my emotion, shocked, disappointed, sad… not sure…my daughter told me it’s OK Mom, let’s get one leaf and go home. Apparently I was not able to make the breakfast what Vineetha posted with the leaves, but used a piece for the picture. So the gloomy look of the picture reveals my attitude towards the leaf :). Here is the recipe for Kerala Style Beef with Bell Peppers. Give this recipe a try and have a great weekend!!! Clean and drain the water from beef and keep it aside. Take a non stick pan and splutter 1/4 tsp of mustard seeds in 2 tbsp of oil. Cook the garlic and ginger till it gets slightly brown. Now add sliced onions and salt and cook till light golden brown. Add turmeric, corainder powder, chili powder, ground pepper, garam masala and asafoetida and cook till raw smell goes away for 2 -3 minutes. Now add the chopped tomatoes and cook till soft. Add the beef, coconut pieces, curry leaves and 1/4 cup of water and cook well covered on low to medium heat till desired texture is attained and all the moisture is dried up. Take another non-stick pan and heat 2 tbsp of oil. Add the whole spices like cinnamon, bay leaf, cardamom and roast for 2 minutes. Add the sliced shallots and bell pepper, give a good stir to mix well. When the shallots turns translucent, add the crushed pepper. You can smell the aroma of crushed pepper. Add the cooked beef and saute to 2 -3 minutes till the bell pepper is cooked. Don't over cook it, so that it will lose the green color. Add the curry leaves and mix well and turn off the burner. 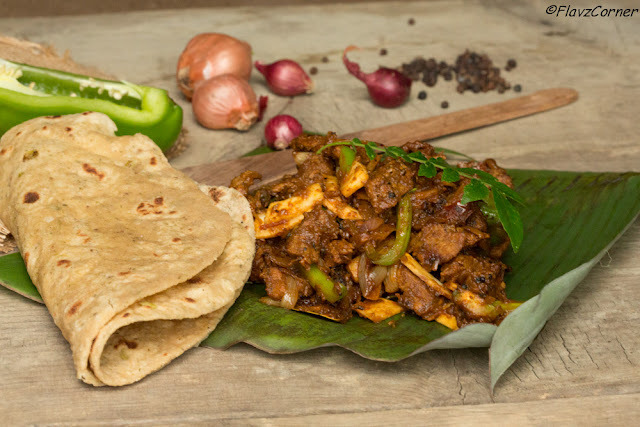 Enjoy the spicy beef with rice or any of the Indian flat breads like Roti, Chapathi or Paratha. what with the leaf dear..leave it....kalliewallie (thats what we say hear..) but see the overall presentaion...classically class !! and with beef roast..pinaae enthoo venam !! This looks like a terrific recipe! It's not a dish I've had before, and the flavors looks wonderful. Sorry to hear about the difficulty with the banana leaves, but the photos came out really well. Good stuff - thanks so much. Thanks for the comment!!! I guess we get the leaves from either Florida or Mexico, so it doesn't really come from India. But I am not sure if it was from a region where there was hurricane, the leaves looked like it though :). We don't buy red meat that often, may be twice a year that's it.